At Prince George’s Animal Hospital near Lanham - Seabrook, New Carrollton, Landover Hills and Silver Spring, MD, we provide a variety of exceptional veterinary services for our patients. Pet Emergency? Call us right away at (301) 577-9400! Welcome to Prince George’s Animal Hospital, where you and your pet are number one. We are so pleased to welcome you to our AAHA accredited animal hospital and we guarantee that you will recognize the cleanliness, organization, state-of-the-art technology, and excellent customer service that sets us apart from the veterinary hospitals of our community. Our team is dedicated to veterinary excellence, passionate about pets, and compassionate to our clients and patients. At our Prince George veterinary hospital, you should expect to be welcomed through our doors by our friendly staff and dedicated team of client care specialists. In our family-oriented environment, our team members greet you and your pet by name. It is a point of pride with us that we recognize each and every one of our patients and treat them all with individualized care. Prince George’s Animal Hospital is dedicated to our community. We have been a trusted veterinary hospital in Hyattsville since 1984, and we have provided exceptional veterinary care and dedicated service since the beginning. We are proud to see our clientele grow because of recommendations from our existing clients, and we also love to welcome our long-term clients again and again. "We are AAHA Accredited - inspected for practicing high quality of medicine, surgery, and anesthesia. Did you know only 10% of hospitals are AAHA Accredited?" 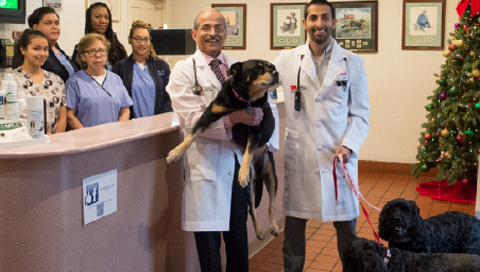 We have been an AAHA accredited animal hospital in Hyattsville since 1992. AAHA accreditation is very important to our team because it is a stamp of approval from the American Animal Hospital Association, indicating that we have achieved and actively maintain the highest veterinary standards. Only 10% of hospitals are AAHA-accredited. We strive to do this year after year, all in an effort to provide you and your pet with the very best. New To Prince George’s Animal Hospital? If you are new to our veterinary hospital in Hyattsville, we are excited to get to know you and your pet. Contact us today to schedule your first visit with our team, or stop by to tour our facilities. Dr. Naren Khianey’s strong passion and appreciation for animals, combined with a love for science and problem solving, shaped his childhood dream of becoming a veterinarian. Dr. Rahul Khianey has been around Prince George’s Animal Hospital since he was 6 years old, and developed his passion for the field watching Dr. K senior working his magic in the hospital. Aminta is new to the Veterinary Medicine field. However, with her dedication and passion for animals has increased her drive to learn and care for our four legged companions. Her positive attitude and patience makes our clients feel welcomed. Viauna is a native of Maryland, and resides in Prince Georges County. She attended the University of Maryland Eastern Shore where she graduated in 2017 with a Bachelor of Science in General Agriculture. She has always had a passion for animals and their well being. She has over 5 years of experience in veterinary and client care assistance. Annabel started working at Prince George's Animal Hospital in 2001 and now she's our main receptionist to tackle our busy Saturdays. She loves her Chihuahua - Lucky, her children, and every Rottweiler she can pet. Carmen has been with our practice for over 26 years. With her consistent hard work, she always keeps the team motivated. Carmen has no limitations with her love for animals to make sure every patient leaves the practice happy and healthy. Lila has been in the veterinary field since 2016. She chose this field because of her love for animals. She is originally from Mexico and has been here for 16 years. She plans to pursue her career in this field. She enjoys shopping and dancing during her free time. Aj has previously worked at an animal hospital as a receptionist and wanted more hands on experience. She is currently majoring in Pre-Veterinary Studies and plans to attend University of Maryland in the fall. In her spare time she enjoys doing gymnastics at the Sports and Learning Complex Center and going to the movies with her friends. Our Newest addition to the hospital as a veterinary assistant, Sonia. She is currently attending Prince George's Community College. Growing up she had many animal companions so she knows that they hold a big place in our hearts and lives. She says she is having a blast so far taking care of our patients. Kevin has been in the veterinary field since 2011 after completing the vetassistant course from Prince Georges Community College. He then worked hereat Prince George's Animal Hospital from 2011 to 2014. He is now back withus and loves to assist with any and all of the fur babies that walk throughour door. Candy loves people and animals and has a bubbly personality. She has worked previously in customer service but this is her first time at a veterinary hospital. She is also fluent in Spanish. "David and I (Vicki Cobb) have used this place since we got Cole 4 years ago. Now we have Gracie, making a total of 2 Scottie’s. Dr K has ALWAYS been gracious, good with our animals, knowledge, and affordable. Now, Dr K.Jr . Is here! We saw him for the first time 2 days ago! Wow! Super thorough . Shared a lot of educational info, and both dogs loved him. Carmen, their assistant.....I cannot say enough about. She’s quiet yet loving. Since Cole was a baby, she’s held him for the doctors, whispering soft Spanish (and English ) in his big ears. He LOVES her!!! Now, Gracie has fallen in love. The place is ALWAYS super clean and now it’s gotten a new modern look! I wouldn’t advise anyone going anywhere else for pet care!" "LOVE THIS PLACE! Awesome doctors, awesome staff, awesome service. Knowledgeable, caring, organized. 5 stars all the way! This hospital has taken care of my dog since I got him seven years ago. I think my dog is more active and healthy now than he was when I got him. One thing I love about Dr. K and his staff is that they emphasize the importance of accountability. They know they are great at what they do, but you as a pet owner have to do the little things right in between visits. It's not just about emergency care, but it's also about preventive care. If you have a pet, bring your pet here for care. You will NOT regret it." "Been going to PG Animal Hospital for four years and both Dr Khianey and his son are wonderful, very professional and good vet." "Both Dr. Khianey and his son Dr. Rahul Khianey are the best, they are both very caring and take time to make sure you understand what's going on and what's best for your pet....but they also aren't pushy with lots of un-needed vaccinations and procedures. I totally trust them with my pets and refer them to all my friends, my dog's love them as well, we were once out and I didn't see Dr. Khianey but my dogs did and were barking and pulling and making such a fuss....I look up and there is Dr. Khianey and his family....I let them go and they ran straight to him...They love him and so do I!"